The Lord's Resistance Army in Uganda are a nasty lot. Imprisoned, hanged, or shot dead in combat, it is hard to imagine anyone shedding a tear for them. What better excuse for his imperialist majesty Barack Obama to insert U.S. troops into east Africa. Apparently bribes and proxy troops are not getting the job done. 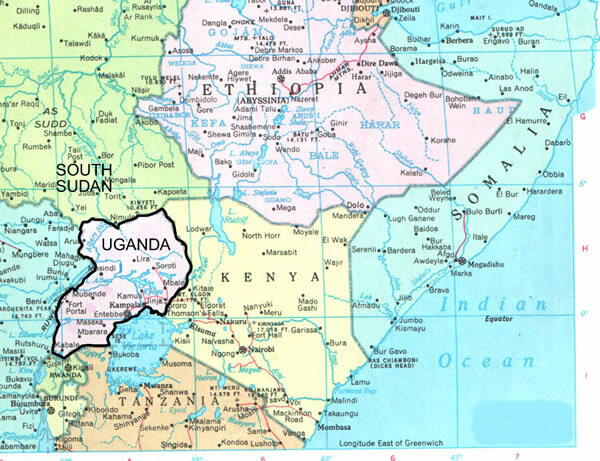 Note Uganda's proximity to the Republic of South Sudan, with its vast oil fields waiting to be tapped. To the east in Kenya, which is more of a region left over from Great Britain's imperial conquests than a nation. Kenya is a mostly Christian identified nation, but has substantial Islamic and (indigenous) pagan minorities. Further due east we have southern Somalia, including the "capital" Mogadishu, where Ugandan troops are stationed to prop up the unelected, corrupt and incompetent puppet U.S. "provisional" government. Note also Ethiopia to the north of Kenya. The U.S. paid Ethiopia to invade Somalia in 2006 and overthrow the Islamic Courts Union system (earlier referred to as the Islamic Justice Courts). While the Somalis eventually ran them out of the country, the peaceful and moderate backers of the Islamic Courts were radicalized by the struggle, leading to the emergence of Al-Shabaab as the most popular de facto government in Somalia (though it has done a lot since then to make itself unpopular). So we can expect Barack Obama's soldiers to train the Ugandan gunmen who will be going to fight the people of Somalia. At the same time President-for-Life Yoweri Museveni's regime will be propped up. As leaders go Mr. Museveni started as a considerable improvement on his post-colonial predecessors. Somewhere along the way he decided that he was indispensable, and democracy had to play second fiddle (just like Franklin Delano Roosevelt). Instead of training and empowering the next generation of leaders, he is determined to take Uganda to the grave with him. In addition, he has supported harsh anti-homosexual laws. Perhaps the Pentagon just wants to get in some real-life jungle training. American gunmen have a poor record in jungle warfare, as demonstrated by the Viet Cong. The Lord's Resistance Army might be easy prey, and then again they have already survived for a couple of decades and may be more adaptable than I, or anyone, expects. As to Somalia, only idiots like George W. Bush, Barack Obama, and their brutish henchmen think that playground has room for anyone besides the natives.